LOS ANGELES (Oct. 9, 2018) – SQUARE ENIX® today announced that the brand-new survival action shooter LEFT ALIVE™, is releasing for the PlayStation®4 computer entertainment system and STEAM® on March 5th. Created by veteran game developers, Toshifumi Nabeshima (director, Armored Core series), Yoji Shinkawa from KOJIMA PRODUCTIONS (character designer, METAL GEAR series), and Takayuki Yanase (mech designer, Ghost in the Shell: Arise, Xenoblade Chronicles X), LEFT ALIVEtells a dark and gritty story of survival from the perspective of three different protagonists as they struggle to escape the war-torn city. Players who purchase the physical Day One Edition of the game will receive the bonus ‘Survival Pack’ DLC, which includes plenty of useful items to help players survive, such as the Ammo Pack, Light Body Armor, Recovery Pack, Klyuch Weapon, and Grenade Pack. 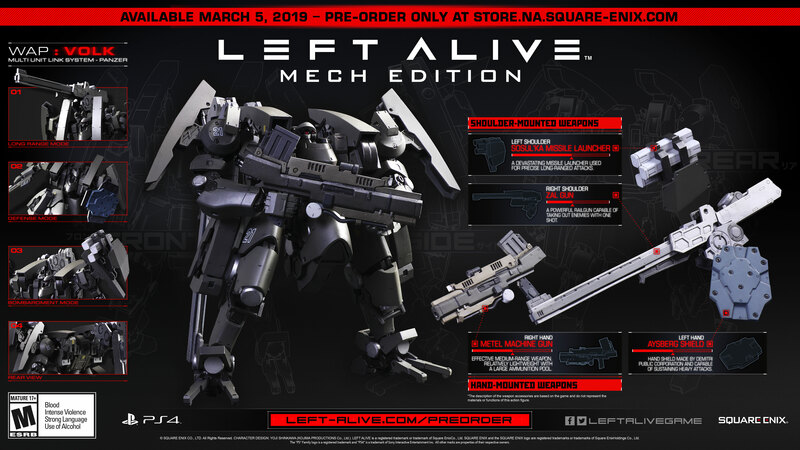 LEFT ALIVE is rated M (Mature). Please visit the Entertainment Software Rating Board (ESRB) website at www.esrb.org for more information about ratings. For more information about the game, please visit: https://left-alive.square-enix-games.com/.